Manual photography will always maintain a loyal group of users, no matter how good phone cameras become, and no matter how advanced digital photography is. And, while some may see manual photography as a hipster past time, others see the practice as a way for professional photographers at the start of their career to hone their skills and test out techniques. For these reasons, manual photography will always be important, so we wanted to show you some of the first steps, from picking your film to adjusting your aperture, that will help you become a manual-photography expert. A printable version can be downloaded at the bottom of the page. And all the details in between! Please include attribution to zippi.co.uk with this graphic. The Printable Version is here! For all those who have been asking, I’m so sorry for the delay! Here is the photographers-cheat-sheet. Please let me know if there are any issues. We have put a lot of time and effort into making this. If you put the graphic up in your studio, please send us a picture of the printed version when it’s up on your wall, door, over your car, wallpapered in your living room, etc. We’d really appreciate it! Use film if you want, I just wanted to let people know that all the aperture and shutter speed and exposure stuff applies exactly the same with digital photography as well. The only difference is with the ISO because a good camera sensor’s ISO 1600 will look almost flawless whereas the film version will have much more grain. Not saying that’s a good or bad thing, just saying that’s the only place where film and digital part ways here. Film certainly makes you slow down and think about what you are doing. Digital allows for much more creativity because you can still use analog filters to get effects, and you can take an unlimited amount of pics with immediate feedback so you can try this and that and this and more all in the same sitting. Use film if you want to try film, just don’t do it because it’s “cool”. It’s not. It’s just one method of doing things. Digital also isn’t “cool”. It’s just another way of going about it. Both are fun, just in different ways. I think digital grain on a 5dMK2 at ISO800 or 1600 is FAR worse and uglier than film grain. This is just gorgeous! I’d like to translate this in french. Would you mind? Do you have a source file I could work on? Thank you very much for this cheat sheet. Thanks for the really well put together cheat sheet. It covers all the basics and I just shared this with a friend who just got her Pentax K1000 today. Thanks for this incredible cheat sheet. I would love to print this in a large format an put it up the wall in my Photo-Print Shop. So that all my costumers can see and read this. Is it possible to receive a bigger file so that I can print it? Glad you like it! I’ve just sent you an email. I would love to print this in large format. Is it possible share with me too? Sorry about the delay! There’s now a CMYK, 300dpi, PDF version to download, just below the infographic. I hope that works. Let me know if there are any issues. Thanks! awesome infographic. would like a copy as well for print in my small studio. Great advice in a very short message! * the digital photographer can choose her/his ISO for each shot separately, the film user is stuck with the same setting for the whole roll. * your list of film formats starts with 35 mm as the smallest, in digital cameras it is the largest (well, for us amateurs, at least) – this has consequences on the depth of field you can achieve with the one technology or the other. It also explains why some digital cameras can have a zoom factor of 50 or so in one lens, which for a 35 mm camera could never work. Wonderful, concise article. I’m sending it to a high school gal who is taking a photography class in school with film. I know she’ll be moving on to digital, but I maintain (after 40+ years as a photographer) that film and the darkroom are the best building blocks. Any chance there’s a printable document (not large scale)? Thank you again for the article. Excellent resource. Can I also have a copy to print and post in my office. 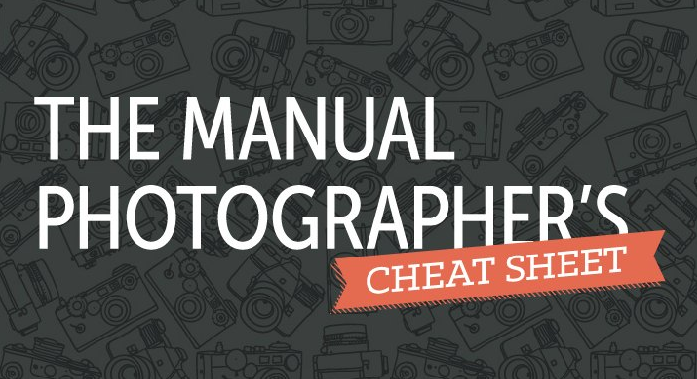 Thank you so much for putting the Manual Photographer’s Cheat Sheet in PDF form. It is something that I will find very helpful. Being able to print and carry it with me will be a great reminder. And when it becomes too creased and crinkled, I can just print another! I do have a problem downloading it, however. The PDF becomes blank just into “Get the Right Exposure”. I don’t know if this is because of my browser (Firefox), Adobe Acrobat plugin, or whatever. Would it be possible for you to email me the PDF? Is there an error or is it intended in the shutterspeed, it goes from 1/1000 for the bird then 1/2000 and back to 1/1000 for the racecar ? Really nice infographic, but I think you’ve got a typo. Your shutter speeds go 1/500, 1/1000, 1/2000 then back to 1/1000. I think for the F1 car you may have meant 1/4000? That’s a really nice cheat sheet. Thanks! I think you forgot Step 4 though: Develop you pictures. that infographic is great, really useful, I’ll print it and give it to my students. Thank you very much. I wish I had saw this post when starting photography. Took me a fair amount of time to figure out the motion blur and depth of field concept. Kudos to this really helpful post. I love this cheatsheet, but I am only able to print the first page. I’d like to carry it with me. Great Cheat Sheet. I have downloaded the pdf version of the cheat sheet however I am unable to print a readable copy even when i print it on A3 (which is the largest sheet of paper that i can print onto. I am uncertain of how I can print such a document so that I can use it effectively.